Pupils from Class 1 of Thorneyholme Primary School in Dunsop Bridge braved the elements this week to help the Duchy plant a new generation of trees in Whitewell. 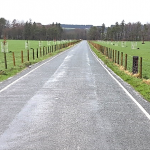 The Duchy’s woodland team planted a new avenue of 50 trees on the Longridge approach to the Whitewell Estate with the aspiration of planting 100 acres of new trees each year for the next five years, using only indigenous species of oak, lime, sycamore and beech. This follows on from the recent acquisition of 22 acres of woodland in Whitewell earlier this year, bringing the total woodland on the Lancashire Survey to over 660 acres. 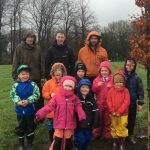 During the planting, the schoolchildren were able to learn about the care of saplings and the importance of responsible arboriculture before planting a beech tree of their own as part of the new avenue. Teacher Mrs Jackie Entwistle said that the children thoroughly enjoyed the experience and are now looking forward to watching ‘their’ tree grow and mature. 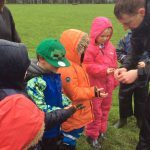 Commenting on the day, Duchy Head of Rural Christopher Sparrow said: “We are grateful to our woodland consultant Matt Brocklehurst and his team for giving the children an insight into the importance of trees across our estates. Everyone was excited to be part of something of lasting value which will be there for future generations to enjoy.